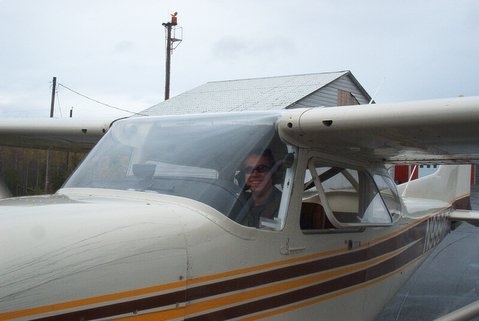 At 4:00 p.m. on Tuesday, October 18, Daniel rolled the Cessna 172 to a stop after completing his first solo flight during training for his Private Pilot's License. See that tiny speck in the sky on the left? 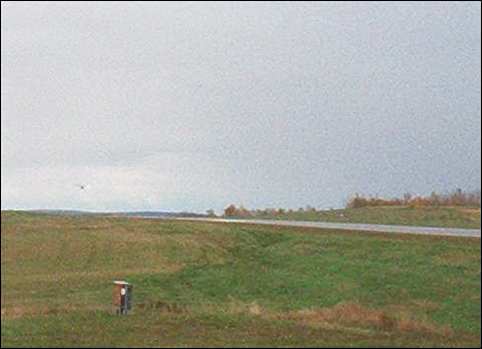 That's Daniel coming in for a landing during his first solo at the Aroostook Regional Airport in Frenchville, Maine. That's located as far north as you can get in Maine - Canada's just across from the border! This is a big milestone for Daniel - a lifelong dream coming true. It was barely 3 months ago (July 8) that Daniel did his first "solo" driving our van to town and back. He wondered for a time if he'd get his pilot's license before his driver's license! 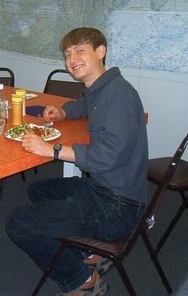 Daniel's good friend and flight training instructor Davey Fernald looks pretty pleased - but maybe that's because he's enjoying a good meal that Daniel microwaved for him at the airport. But he was probably was bursting with pride as he watched Daniel reach this milestone, after 56 hours of training. 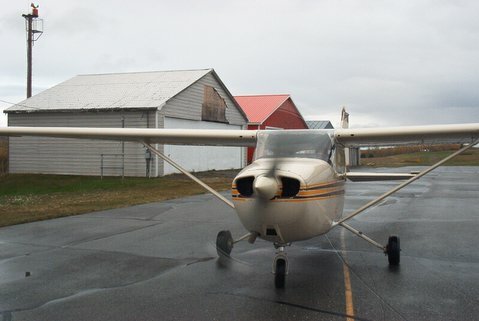 As Daniel circled to land, Davey ran into the office, grabbed Daniel's camera, and snapped the above pictures. And Daniel's pretty pleased as well - he loves flying, and looks forward to getting his license within the next few weeks. 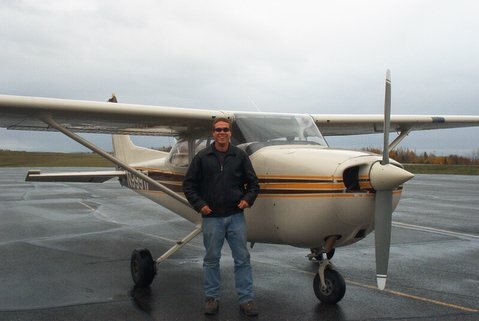 He still needs more hours of cross-country, night flying and solo flying, as well as the written test and final certification from an examiner. 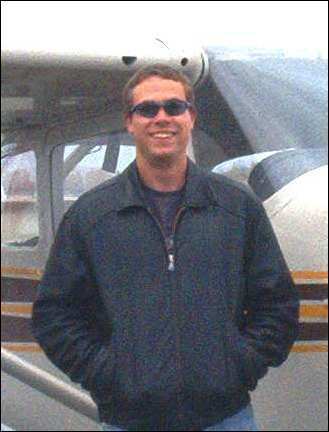 The following day Daniel flew 8 hours, ferrying passengers to Manchester, New Hampshire, landing at Portland, Maine and several other airports. His training included solo landings and take-offs at airports with towers, communicating on four different frequencies with ground personnel, control tower, and other departments. He said that was kinda scary, especially since he had to fall into a landing pattern with other planes, watching out for those big fast jet passenger planes. There was one time when he misunderstood a tower command, and started going the wrong way. He had to call the tower and ask, "I'm not sure what I'm supposed to do now - can someone help me?" So that's what's happening in Daniel's life at this moment. Click here to read a short note from Daniel's perspective.